This year, Iceland became the smallest country ever to have its men’s soccer team qualify for the World Cup. To celebrate, Icelandair, which sponsors the team, is launching a special soccer-themed version of its famed stopover program. Passengers can apply to participate in Team Iceland Stopover: a selection of 90-minute, soccer-inspired experiences curated by members of Iceland’s men’s and women’s teams and taking place from May 29 through the end of June, 2018. The experiences range from attending either a National Men’s or Women’s team match and hanging with midfielder Birkir Bjarnason at his favorite geothermal area to attending the June 16 party to celebrate Iceland’s World Cup match. Anyone can apply to be part of the Team Iceland Stopover experiences, but there are limited spots. You’ll need to be flying on Icelandair and your itinerary will need to match up with the program events. See the Icelandair website for more details. Football & soccer season is in full swing and airlines are offering football-themed contests and flight discounts. To celebrate the launch of Allegiant service to Fort Lauderdale (FLL) from Cincinnati/Northern Kentucky International Airport (CVG) on Thursday, October 9. the airline is hosting a Best Dressed Bengals Fan Contest at the airport. The winner will get two round trip tickets on the first flight to FLL and a hotel stay at the Comfort Suites Airport & Cruise Port from October 10 – October 13, 2014. Entry details here. Both Delta Air Line and Alaska Airlines are offering sports fans discounts on airfare to cities where away games are being played. 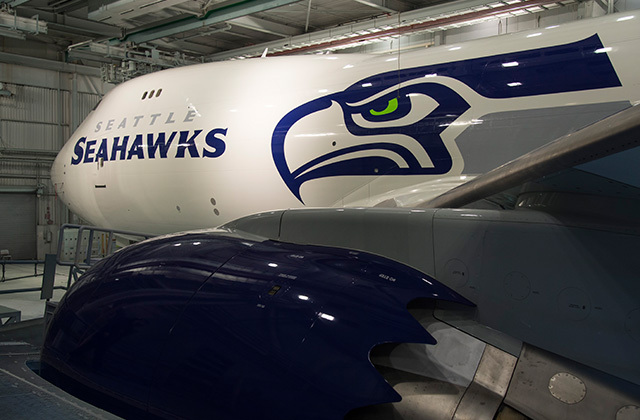 Delta Air Lines just announced up to 10 percent off fares to away games for the Seattle Seahawks and the Seattle Sounders (soccer). To get the discount, enter NMK7V in the “Meeting Event Code” field when booking on delta.com. Alaska Airlines continues to offer early boarding to Seattle Seahawks fans wearing NFL quarterback Russell Wilson’s No. 3 jersey on flights departing Seattle-Tacoma International Airport. The airline is also offering a 10 percent discount on flights to certain away games. Details here. With a month-long schedule of special events and programs, we knew Miami International Airport had World Cup fever, but it turns out Orlando International Airport is soccer happy as well. The airport has set up a special viewing room in the main terminal building, across from the bank and next to the postal services and the spot has been quite popular with both passengers and with employees on their breaks. The 2012 World Cup kicks off today in Brazil and Miami International Airport – which expects to see 200,000 passengers pass through on their way to and from the games – is kicking off its own month-long soccer-themed celebration. Look – and listen – for: Brazilian music and dance performances; interactive mini-soccer fields featuring professional soccer players; Nintendo Wii™ Soccer game stations; a soccer-themed art exhibit, World Cup and national team clothing and accessories at MIA shops; a children’s cart with activities and soccer-themed face-painting and, of course, plenty of TVs tuned to the games, including a 90-inch flat screen TV in the upgraded MIA Hotel lobby pre-security at Central Terminal E, 2nd Level.